THE NATIONAL ENDOWMENT FOR THE ARTS is offering grants to nonprofit and public agencies through the Our Town Program. Grants will support arts engagement, cultural planning and design projects. Deadline: 9/11/2017. 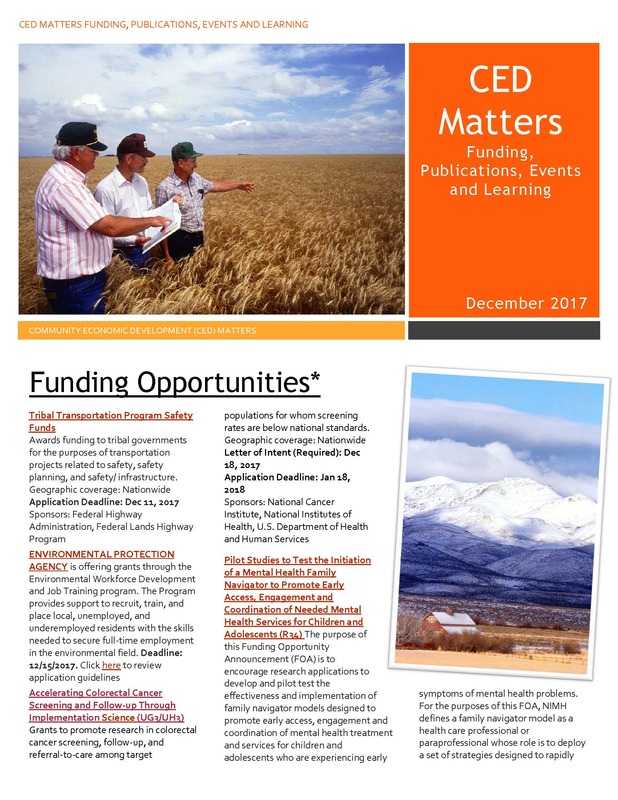 FOUNDATION FOR RURAL SERVICE is offering grants to nonprofits seeking to create programs that promote business development, community development, education or telecommunications in rural communities served by National Telecommunications Cooperative Association (NTCA) members. Awards range from $250 to $5,000. Preference will be given to proposals that foster collaboration among and community engagement, and that can be fully funded by the grant or have 75 percent or more of the project currently funded. Deadline: 9/15/2017. The Kent Richard Hofmann Foundation is offering grants throughout the United States, with a particular focus in smaller communities and rural areas. The Foundation supports community-based nonprofit organizations that focus on HIV/AIDS care and direct services, education, or research. Grants are provided to developing or established programs, with emphasis on those that provide direct benefit to clients or target audiences. Requests are reviewed two times per year. Deadlines: letters of inquiry 9/1/2017; invited grant applications will be due 9/22/2017. Grants to help schools and parent teacher groups with school improvement and to provide for the basic needs of their students. Funding and technical assistance to help minority serving institutions and community colleges advocate for, adopt, and implement a 100% tobacco-free college policy. First Nations Development Institute (First Nations) has launched a new Supporting Native Arts grant opportunity under its Native Arts Initiative (formerly known as the “Native Arts Capacity Building Initiative” or NACBI). Applications are due by Thursday, October 19, 2017. 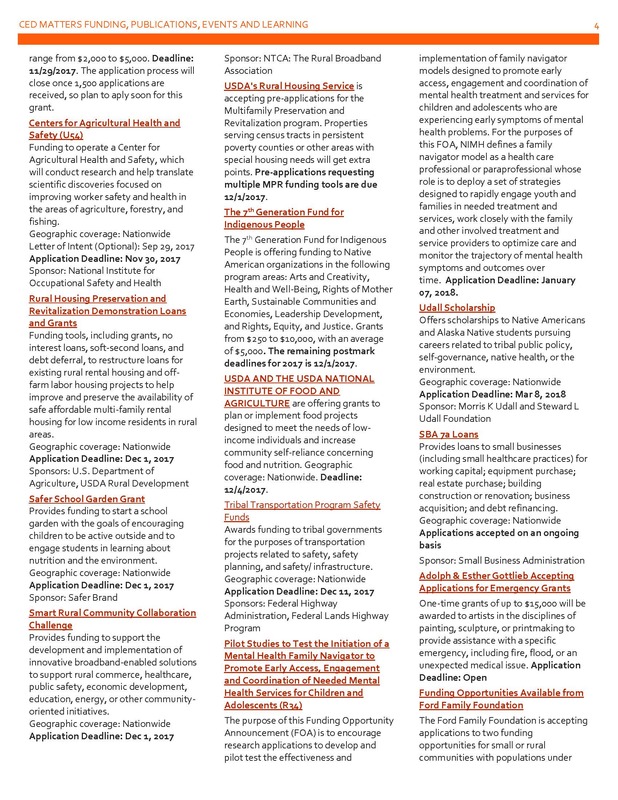 The Request for Proposals for the Supporting Native Arts grant opportunity can be accessed here. 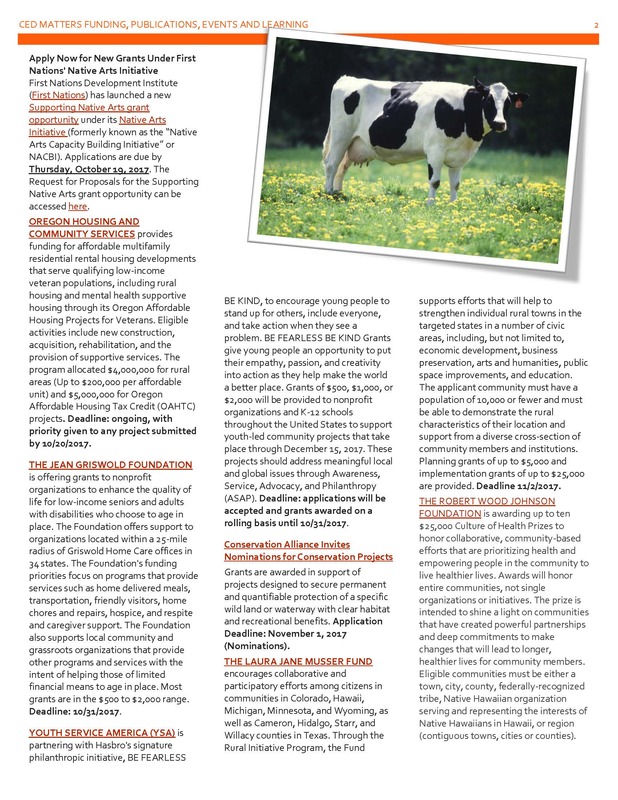 Funding to operate a Center for Agricultural Health and Safety, which will conduct research and help translate scientific discoveries focused on improving worker safety and health in the areas of agriculture, forestry, and fishing. The 7th Generation Fund for Indigenous People is offering funding to Native American organizations in the following program areas: Arts and Creativity, Health and Well-Being, Rights of Mother Earth, Sustainable Communities and Economies, Leadership Development, and Rights, Equity, and Justice. Grants from $250 to $10,000, with an average of $5,000. The remaining postmark deadlines for 2017 is 12/1/2017. The Ford Family Foundation is accepting applications to two funding opportunities for small or rural communities with populations under 35,000. The Good Neighbor Grant offers funding to address unexpected needs or simple projects. Grants are available between $1,000 and $10,000. Applications are accepted on a rolling basis. Additionally, the Community Building Spaces Grant offers funding for the development of public spaces. Various uses of funding include land acquisition, purchasing buildings, construction and renovations, among other activities. Grants are available between $50,000 & $250,000 and accepted on a rolling basis. For more information on the Good Neighbor Grant, click here. 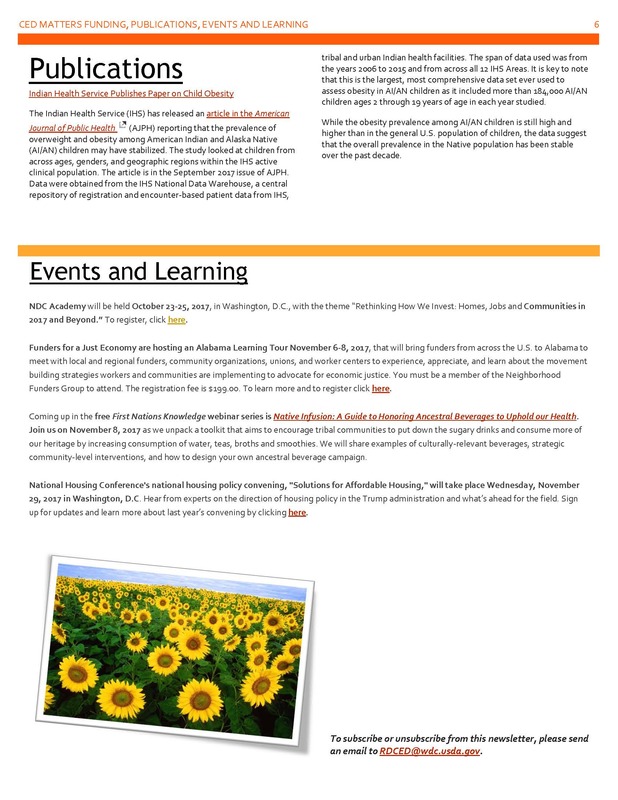 More information on the Community Building Spaces Grant is available here. Application Deadline: Due Rolling Basis. Funding for clean and reliable drinking water systems, sanitary sewage disposal, sanitary solid waste disposal, and storm water drainage to households and businesses in eligible rural areas. A loan guarantee program that helps private lenders provide affordable financing to qualified borrowers to improve access to clean, reliable water and waste disposal systems for households and businesses in rural areas. 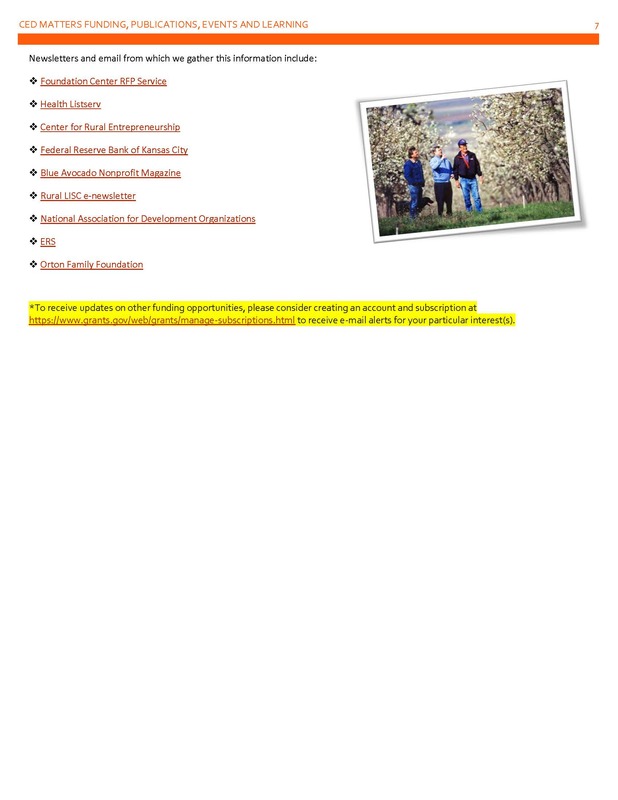 Offers grants to organizations that operate near a BNSF railway line. Among others, priority areas include health and human service organizations, programs that address chemical dependency treatment and prevention, spouse and child abuse, women's and children's aid, transitional shelters, hospitals, medical programs, and youth development programs. The Economic Development Administration (EDA) announced approximately $30 million in funding for the Assistance to Coal Communities (ACC). 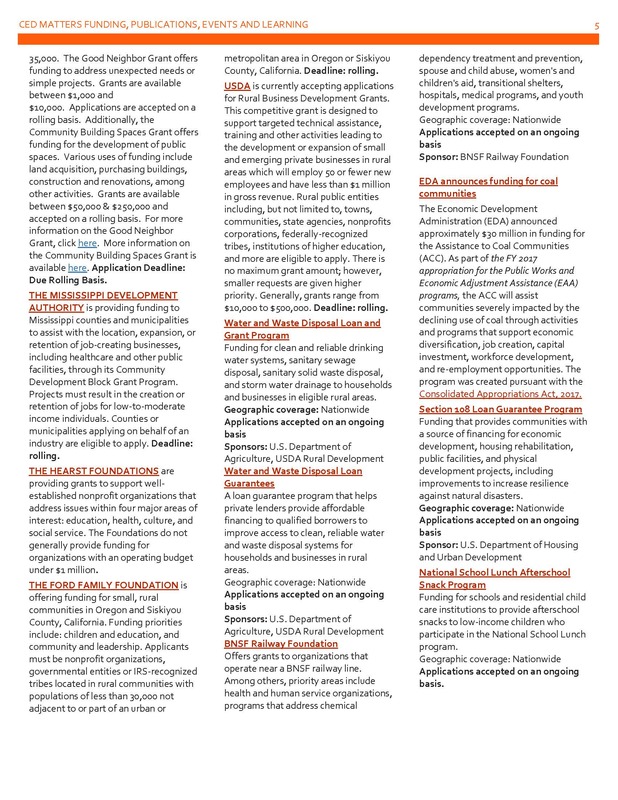 As part of the FY 2017 appropriation for the Public Works and Economic Adjustment Assistance (EAA) programs, the ACC will assist communities severely impacted by the declining use of coal through activities and programs that support economic diversification, job creation, capital investment, workforce development, and re-employment opportunities. The program was created pursuant with the Consolidated Appropriations Act, 2017. 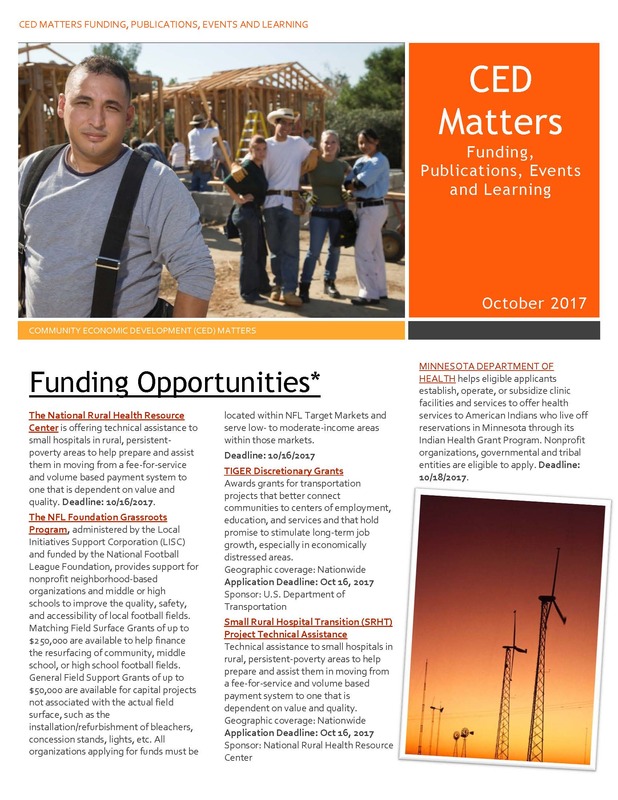 Funding that provides communities with a source of financing for economic development, housing rehabilitation, public facilities, and physical development projects, including improvements to increase resilience against natural disasters. Funding for schools and residential child care institutions to provide afterschool snacks to low-income children who participate in the National School Lunch program. Grants for projects to identify and train students in relevant disciplines, such as sociology, social work, and psychology, who are interested in victim service positions specifically serving tribal communities. Funding to provide, on an ongoing outpatient basis, high quality early intervention services/primary care to individuals with HIV infection. The Department of Veteran Affairs is offering Grants for Transportation of Veterans in Highly Rural Areas (HRTG), which award funding to organizations that assist veterans in rural areas with transportation to VA medical centers and other VA and non-VA facilities for medical care. Grantees should use innovative approaches to transportation. 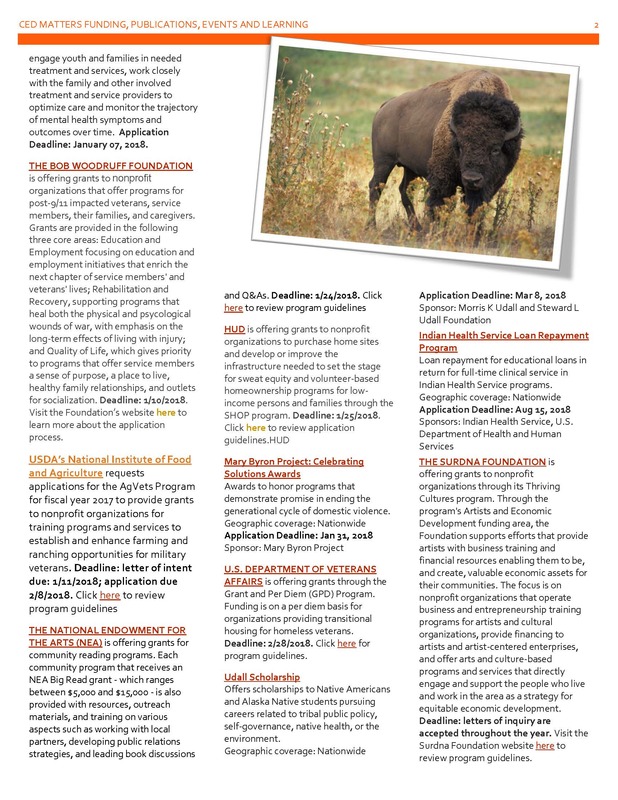 For this round of funding, only current 2016 veterans service organizations and state veterans service grantees are eligible to apply. Approximately 15 awards of up to $50,000 will be made. Deadline: August 20, 2017. THE LOWE'S CHARITABLE AND EDUCATIONAL FOUNDATION is offering grants through the Foundation’s Community Partners grant program to nonprofit organizations and local municipalities undertaking high-need projects such as building renovations and upgrades, grounds improvements, technology upgrades and safety improvements. Grants range from $2,001 to $100,000. Applications for the fall funding cycle will be accepted from 7/3/2017 to 8/25/2017. HUD is awarding Choice Neighborhoods Planning Grants to support the development of comprehensive neighborhood revitalization plans which focus on directing resources to address three core goals: Housing, People and Neighborhood. To achieve these core goals, communities must develop and implement a comprehensive neighborhood revitalization strategy, or Transformation Plan. The Transformation Plan will become the guiding document for the revitalization of the public and/or assisted housing units while simultaneously directing the transformation of the surrounding neighborhood and positive outcomes for families. Deadline: August 28, 2017. 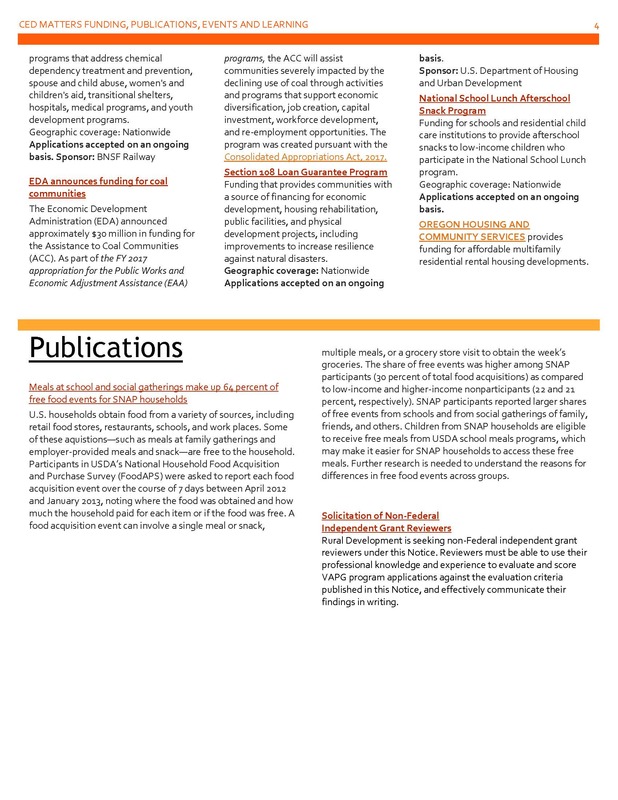 THE U.S. DEPARTMENT OF HEALTH AND HUMAN SERVICES will provide funding to nonprofit agencies to enable refugees to obtain self-sufficiency by obtaining the means to secure professional or skilled employment drawing upon previously-acquired knowledge, skills, and experience. Deadline: 8/29/2017. Grants to finance affordable housing and community revitalization efforts that benefit low-income people and communities. TD Charitable Foundation is accepting applications for its annual Housing for Everyone grant competition. In 2017, the program will support projects/programs that fall within the theme of Affordable Housing for Single Parent Families. Applications must highlight the ways in which funding will create new or preserve existing units of safe, clean, physically accessible affordable rental housing for families headed by a single individual (parent, grandparent, or guardian). TD Bank will award 25 $125,000 grants to affordable housing organizations within its corporate footprint from Maine to Florida. Deadline: Friday, September 1, 2017, by 4:00 PM EDT. HUD is offering grants to public and private agencies to promote a community-wide commitment to the goal of ending homelessness and to optimize self-sufficiency among those experiencing homelessness. Deadline: 9/28/2017. CCHD is offering grants to support organizations led by low-income individuals as they work to break the cycle of poverty and improve their communities. 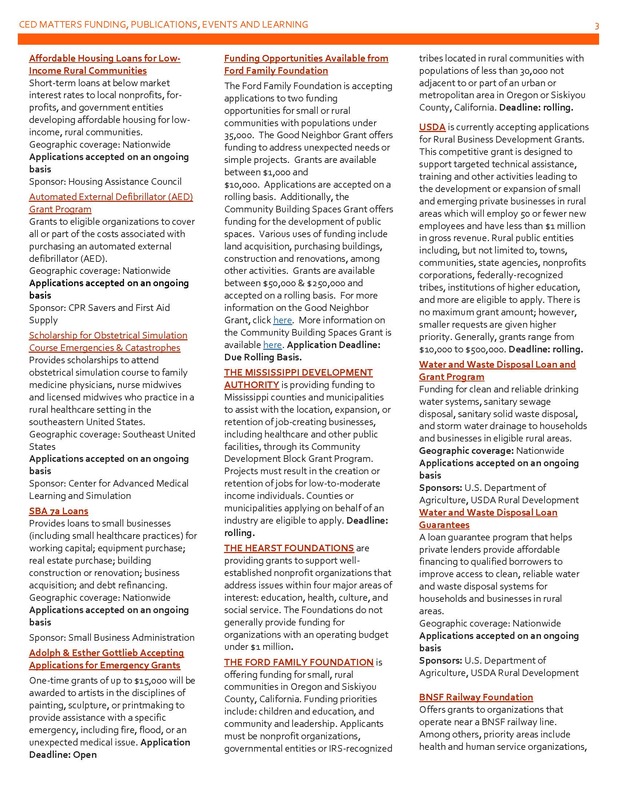 CCHD’s grant programs include two types of grants: Community Development Grants support nonprofit organizations that nurture the participation of people living in poverty to change structures and policies that affect their lives: at least 50 percent of those benefiting from the applying organization's efforts must be people experiencing poverty. Economic Development Grants support economic development institutions that include the voice of the poor and marginalized in developing new businesses that offer good jobs or develop assets that will be owned by local communities. Grants range between $25,000 and $75,000. Deadline: pre-applications for both programs may be submitted between 9/1/2017 and 11/1/2017. (Organizations are encouraged to submit their pre-application prior to the November 1 deadline.) 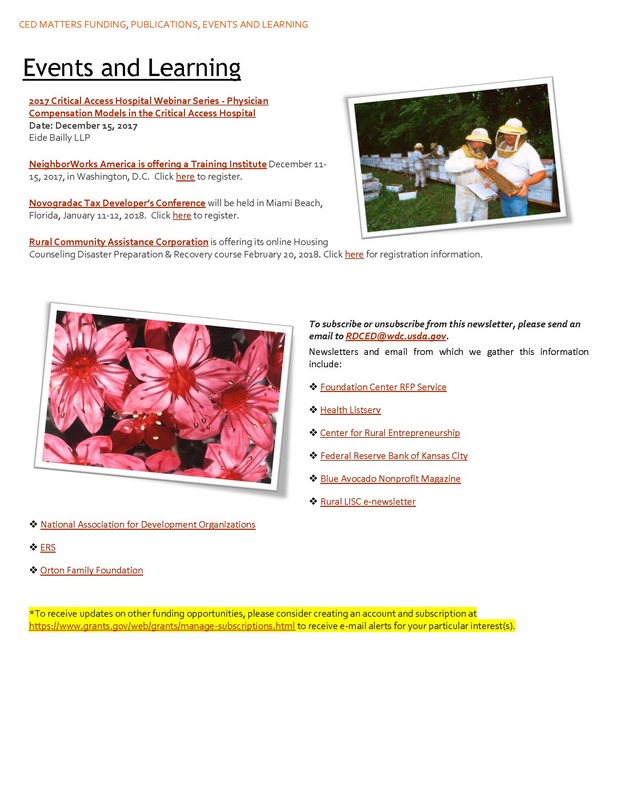 Visit the CCHD website here for more information. The U.S. Department of Commerce is offering grants to provide investments that support construction, non-construction, planning, technical assistance, and revolving loan fund projects under Economic Development Administration’s Public Works and Economic Adjustment Assistance programs. The Public Works program provides catalytic investments to help distressed communities build, design, or engineer critical infrastructure and facilities that will help implement regional development strategies and advance bottom-up economic development goals to promote regional prosperity. The Economic Adjustment Assistance program provides investments that support a wide range of construction and non-construction activities in regions experiencing severe economic dislocations that have occurred suddenly or may occur over time. A portion of Economic Adjustment Assistance funding supports communities and regions that have been negatively impacted by changes in the coal economy. 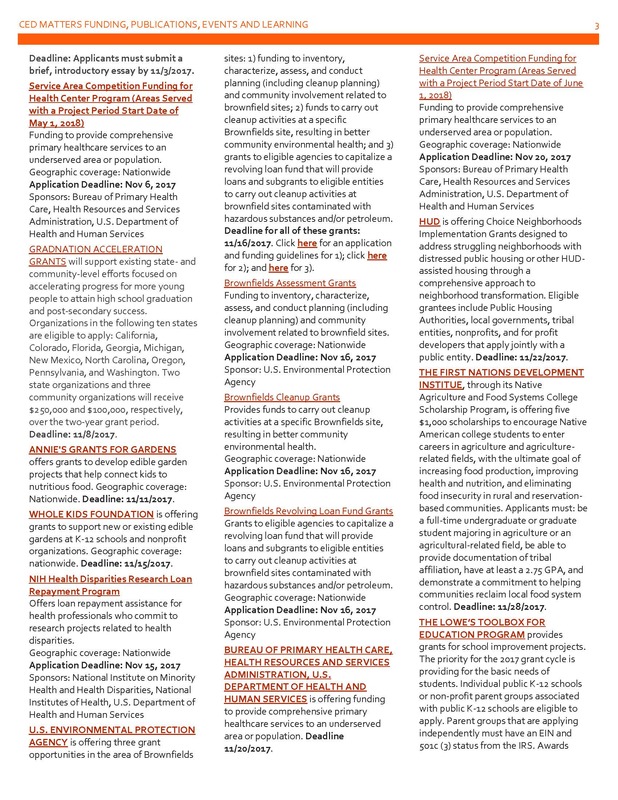 Eligibility: District Organizations of a designated Economic Development District; Indian Tribes; States, counties, cities, or other political subdivisions of a State; institutions of higher education; and public or private nonprofit organizations or associations acting in cooperation with officials of a political subdivision of a State. Deadline: ongoing, until the publication of a new program announcement.